In 2010, Valicia, like many of us with frenetic schedules, was busy with her normal routines and activities. Breast cancer, or any other serious medical problem, was far away from her 47 year old mind. Her life was full of the beautiful normalcy of day trips to the beach and spending time with family. 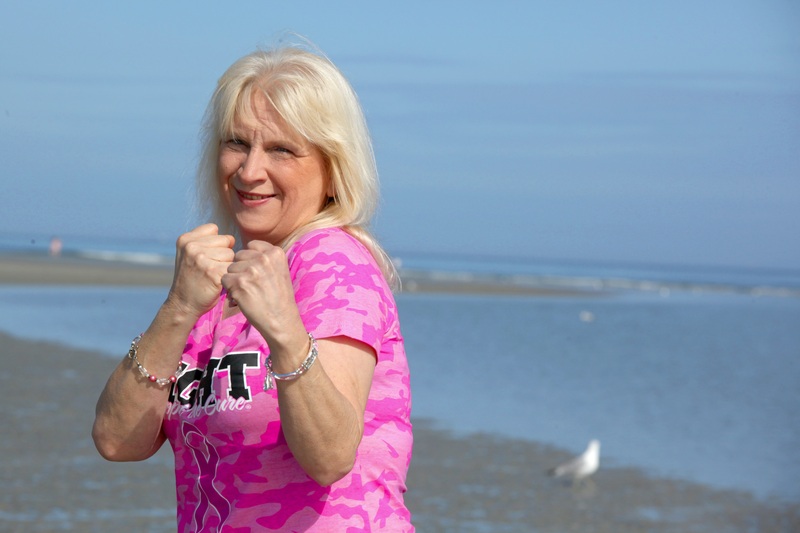 “Before I found out about having breast cancer, I never really thought about taking the time to conduct routine breast exams, including those that should be done monthly by myself. I was always on the go, and never ‘made’ time for an illness or really concerned myself with my own health.” Valicia is certainly not alone in this regard. It is an easy thing to do to put one’s own health on the back burner when juggling the numerous demands of life. Her story, however, does underscore the importance for people of all ages to incorporate screenings and healthy practices into a normal routine. Like many survivors, Valicia would learn to lean on those closest to her to draw strength for the upcoming fight. “Through this journey I learned not to sweat the small things and enjoy every minute with my family. Without the constant love and support from my husband, kids, grand kids, and friends, I don’t think I would have mentally made it through this storm.” It is natural for people to react differently when faced with times of great crisis, but the optimism and courage of a survivor will always shine through no matter how painful the challenges are. The “small things” that Valicia referred to included: two operations, 25 physical therapy sessions, four rounds of chemotherapy, and 33 separate rounds of radiation. Deep down, Valicia is not the kind of person who cowers from the storm, but rather one who hears a distant roll of thunder and instinctively reaches for her tap shoes. It has been a handful of years since Valicia’s journey began, and her experiences have changed her in a number of ways, both obvious and subtle. Her story is a testament to all of us of the power of the human spirit and its ability to overcome tremendous adversity. Above all, her journey is a reminder that the truly courageous know in their heart that when the sky begins to dim, and the winds begin to rise, there will always be a bit of sunshine waiting for us beyond the storm clouds at hand.